To a large extent, England is lush green countryside. Stately mansions and picture-perfect villages with teahouses and antiques shops are tucked in the folds of rolling hills. This bucolic idyll is staggeringly at odds with recent history. The industrial revolution started in a picturesque valley near Birmingham. At some point in the late 18th century, it produced a substantial share of the world's steel. Today, that valley is more picturesque than ever. There, as all over the country, former factories have been shut and either demolished or turned into museums or homes. Little of the grime, noise and stench of yore remains. It's all a bit dissatisfying. The visual traces of a history that was big, loud and dangerous are often bland like memories purged of excitement. England is marketed as "a green and pleasant land", and while that's a fair description, there is much more to it. Out of the spotlight are places that don't fit the gentle narrative of tourist agencies. I'm always excited to I discover them. I like views that jar, sights that one wouldn't necessarily think of photographing, and landscapes that disturb. Taking inspiration from a travel dispatch in The Times, which I had cut in anticipation, I took the train to Benfleet, halfway down the Thames estuary and just across from Canvey Island, the topic of the cutting in my back pocket. A tune of rural English orthodoxy ran through the article. The callout mentioned "acres of green marshes where piebald horses grazed and skylarks sang overhead". I had embraced the described walk because of the suspicion that the unspoiled nature was a bit of a stretch, but I had no idea just how good it would be. The directions were easy enough to follow only at first when the description of the walk matched what I saw. Turn left out of the station, onto the island, then onto the seawall to the right. I ticked off points one and two, but the seawall didn't show. Near a roundabout but far from sea or wall, I clambered onto a dyke with a Public Footpath sign, unsure of the continuation a mere ten minutes in. The roundabout was on the little map that accompanied the text. The road running west wasn't. And yet it was that road that the path paralleled well within earshot. Tentatively stepping forward, I debated whether I'd interpreted the directions correctly. The general swing of the footpath, sharp right after a while, then left in a gently sloping arc argued for the motion. It was in fine agreement with the dotted line on the map. The dyke, failing to look anything like a seawall, and the road, which wasn't on the map, argued against. The text didn't boost my confidence. It promised a nature reserve with reedbeds and fields alive with birds. I saw a big blue heron-like bird in the distance, but otherwise the expansive wetland appeared barren, the silty brown of a recently receded tide instead of lush green. There was no chirping or tweeting either. All I heard was the highway. Respite came only when the path crossed underneath a bridge and traffic was muffled for a few steps by a meter of concrete overhead. I ambled on and, to my great relief, the road faded away. The surroundings became more pastoral, turning into backcountry as much as that's possible in densely populated southern England. The path became a neglected trail, evidence that the Times article hadn't made much of a splash. Grasses and bushes grew to my chest and the trail often struggled through thickets. My legs were quickly scratched, my shorts soiled. Good thing blackberries weren't in season. Bushwhacking with my eyes on the challenges immediately ahead, I was enclosed by nature and became increasingly afraid that I had come for the wrong reasons. Then I saw the refinery, rising from the bushes like an alien invader. It was big and ugly and stood where I was headed. To my right, large white patches on a hillside resolved into operative areas of an enormous landfill. Clouds of noisy seagulls hurtled about overhead, while on the ground heavy machinery dispersed the rubbish. The wind was blowing hard in the right direction, washing the worst odors towards London. Still, the sweet smell of rotting socks hung in the air. I told myself it was the flowers and moved on. The sun beat relentlessly. Over the next half hour, the refinery oscillated in my vision, shifting from straight ahead to left and right and back, reflecting how the path twisted and turned. Then I stood at Holehaven Creek and could go no further. The refinery across the creek looked like a picture. Nothing moved, and there was no noise. It has been closed since 1999, but Shell hasn't found a good moment yet to tear it down. Near a floodgate of considerable age that would be precious heritage in any other setting, the path split. Ominous R.V.P signs (rendezvous point for emergency vehicles, I later learned) pointed in the wrong direction, taking me away from the creek and then through abandoned land towards a farm straight from a spaghetti western. A Hampshire gate barred my way and I had to retreat. When I saw the creek again, after an inspired shortcut through the unknown, it was from a proper seawall. Canvey Island hovers halfway between the tides and was for eons in a fluvial limbo, tormented daily by a river that couldn't be contained. Then, in the early 17th century, Dutch builders drew the first effective dyke around the island and banished the scare of the river. So confident were they in their skill that they took parcels of land on the island as payment for their work, and settled there. The defenses were continually strengthened and the island was inhabited year-round, but it remained at the mercy of the water. Storms in the North Sea frequently conspired with high tides to inundate the island. The most recent disaster was in 1953 when 58 were killed. It was then that the current wall was built, a monster of reinforced concrete rising four meters above the high-tide level. I began walking next to it and felt dominated. Built without concessions to the scenic requirements of the seaside, it rises without subtlety next to the path. It was just high enough to block the view but too low to give shade. The sun was by now burning in zenith. I strayed a bit to the left towards the wilderness of yet another nature, momentarily tempted by more conventional beauty. Then I was drawn back to where I had walked. Up ahead stood giant skeletal limbs, black against the blazing sun, a metal centipede crawling into the tide. I was approaching the Occidental oil jetty. 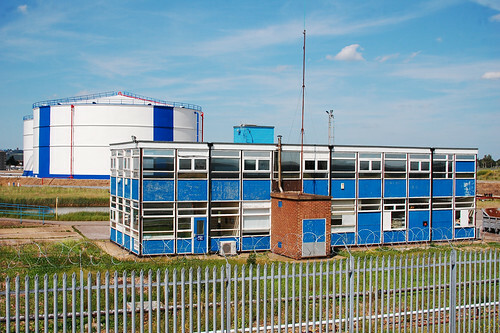 Canvey Island was ahead of its times in the 1950s when the first terminal for liquefied natural gas was built and the first specially refitted container ship welcomed. Refineries, more terminals, storage facilities and other infrastructure were supposed to follow. Some did, others didn't. Ambitious projects were started, then abandoned, left to dereliction, then demolished. The nature reserve I had just passed was once the Occidental oil refinery that never got beyond the initial stages of construction. Now plants have taken over, but the circular foundations of dozens of storage tanks are still discernible as shapes in aerial views. 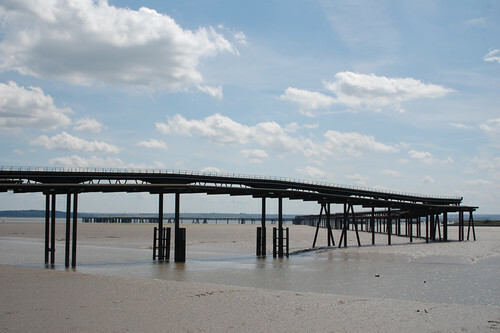 What remains standing is the oil jetty, a black monstrosity of a hundred legs that juts across the mudflats and towards the river with as much joyfulness as Southend's famous "world's longest pleasure pier". When it was built, there was nothing joyful about it. It was all business, the plan of extracting money from muck and dumping the waste right there. This never happened, the project incomplete either because of financial difficulties of the investors or opposition from the locals. Now, forty years on, there were people on the jetty, dark silhouettes against the sun, fishing rods accentuating their presence. It was not clear how they got there. The jetty is not a tourist attraction. There are no stairs up to it. The steel trestlework tower on the left side of the path, the end of the jetty in its current state, was surrounded by wire mesh fencing carrying signs of grave warning: "Trespassers will be prosecuted." I would have loved to be one of the trespassers but had to carry on. Two thirds of my walk still remained, and it was far beyond lunchtime. Half a mile down from the jetty Holehaven Creek merges with the Thames. A public house marks the spot, its name as full of contrast and contradictions as the walk had so far been. The Lobster Smack balances promise and pain, the luxury of fine seafood weighed against bare-knuckle fights. Both were distant memories. Fights were staged there in the mid-1800s, and the last lobster can't have been served much later. The pub was now a cheap franchise, its laminated menus designed at national headquarters half a year ago. It sat uncomfortably at the foot of the dyke, without river views and only a backdrop of gasometers for scenery, but the benches outside were packed. The beer was cold and the fish and chips was like fish and chips should be, a ruthless attack on arteries and sanity. I ordered both; it weighed me down for the rest of the walk but kept me fed until late. To continue my walk I had to get back to the seawall, which looked like part of a medieval fortification from where I had eaten. Ramparts sloped up beyond the benches and rose above the pub itself. High up there, incomprehensibly, was the top of the seawall. 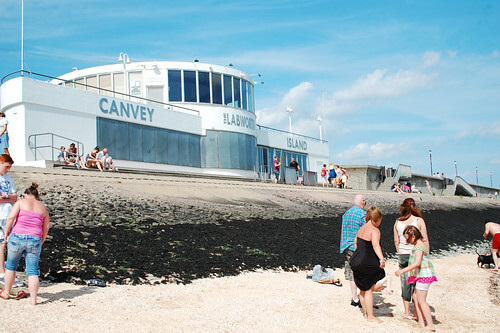 Much of Canvey Island lies below sea level. At high tide, one can hear the Thames slap against the island's only line of defense. I scrambled up to the path that continued besides the wall. I could still not glimpse the water; the wall was too high. Landside was a metal picket fence topped with razor wire and beyond it acres of glorious industry. For half an hour, only the names on the signs changed. The scenery remained the same: fat pipes languidly corroding, spill ponds, brightly colored office sheds, gas storage tanks, piers. These were petrochemical facilities, still in operation. Spaciously installed on finest PR grass (Look, we're green! ), they looked like an industrial edutainment park. "Warning, dogs on patrol", a sign read. This was not the England of glossy brochures and global campaigns. I started to enjoy this tremendously. Between the Lobster Smack and the first gasometers I had seen a collection of two dozen bungalows. Immobile homes, moored oversized camper vans, holiday cottages – whatever name I gave them, it didn't fit the surroundings. 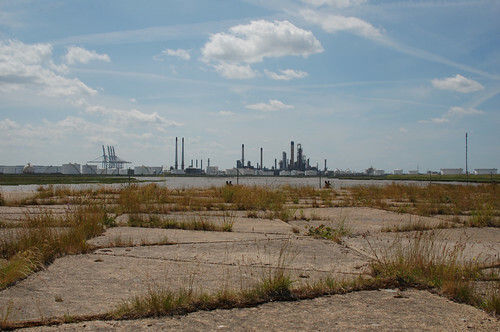 Who would want to spend time in the shadow of petrochemical industry? They were neat and accurately aligned but without a trace of life. I thought about what sour secrets the ground might hold after decades of poorly regulated industrial activity, and wasn't surprised. The scene was repeated, and magnified out of proportion, in Thorney Bay. 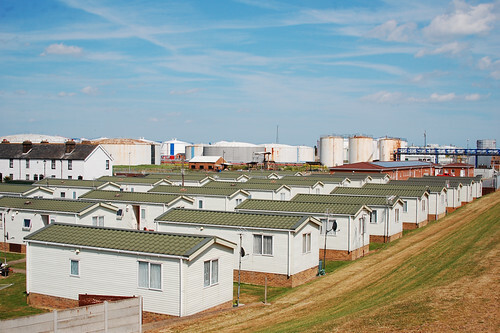 A trailer park of industrial scale and uniformity stretched adjacent to the industrial site I had just passed. It was one of those holiday camps that were popular in Britain up to the 80s. Paul Theroux encountered them on the Cornwall stretch of his circumambulation of the Kingdom by the Sea with the same bafflement that I now felt. These camps hark back to a time when Britain took collective summer holidays by the coast, when entire towns emptied as the factories shut down for a few weeks and the workers went to the seaside in narrowly prescribed ways, guided by lack of money as much as by lack of imagination. But who would stay there now? Who would stay at an English seaside town at all? Walking along the coast is wonderful but the towns that get in the way are all abominations. Their heydays long behind them, they now ooze decay and neglect. They became screaming popular when the Victorians extended the railroads from London, but with budget packages to Spain, people went where sun and heat were more reliable. To fight back, the resorts built amusement arcades and bingo halls, and covered crumbling facades with so many layers of paint that it has turned structural. There's no elegance and very little charm. The sea is almost a side note. Sure, people lounge on beaches reading the Sunday papers as if they were in a pub. But fishermen don't go out in a boat at night to supply the market by the port the next morning. The ubiquitous fish and chips places emphasize the disconnect between the land and the sea. The fish is the same everywhere and the same as in London. It is probably brought in frozen from Billingsgate. Pound shops, döner kebab and off-licenses complete the dismal picture. There are no ice cream parlors; it's a flake or nothing at all. Thorney Bay was the first bit of beach I saw on my walk, 200 meters of dirty sand separated from the turbid waters of Thames by a vast expanse of mud. High above the low-water level was flotsam left by the tides. Here and there were remainders of older flood defense systems, now all but reclaimed by the river. The pieces of wood, black and corrugated, that stuck up from the mud looked beyond age. I was now entering the touristic part of the island. Here, the seawall didn't drop sheer; it topped a dyke that gently sloped to the water. The path was outside the wall, by the beach that stretched endlessly but was only a few meters wide. On the other side was suburban gloom. My walk had already taken much longer than anticipated. I was looking forward to a coffee, but the Labworth Café, the only beachfront café on the island, was closed. Two workers were battening the panoramic windows as if the storm of the year were approaching. The relics of industry behind me, my interest had run out. Continuing the walk as described in the paper would have meant a few more hours on the seawall, until the circle would close by the bridge and the train station. It was late, I was tired, the sun was still hot, and I cut it short – through the quickly dissipating town at first and then on a footpath through meadowland and the lush green countryside that is England.